As one of the world’s most fragile fruits, raspberries present a challenge when it comes to packaging and shelf life, but new research aims to circumvent these issues whilst also allowing the traditional summer fruit to be enjoyed in autumn. TIA PhD Candidate Ky Nha Huynh is helping solve the interlinked problems of packaging and shelf life for the Tasmanian berry industry. The research is part of Ms Huynh’s project with the ARC Training Centre for Innovative Horticultural Products, located at TIA. “The shelf life of raspberries is relatively short, compared to larger fruit,” she said. Ms Huynh said the hollow structure of berries means they need to be handled with care, including when being washed. Keeping berries fresh for longer is a ‘Catch-22’ as the berries lose moisture from refrigeration but need to be refrigerated to stay fresh. Ms Huynh is testing the quality of the berries after being stored for 2 weeks in different packaging and with different atmospheric conditions. It’s no surprise that the packaging Ms Huynh is testing is called ‘Modified Atmospheric Packaging’ or MAP. “MAP packaging, on its own, is not designed for any one specific fruit or vegetable. But because it’s sealed packaging, we can alter and test the levels of natural gasses in the atmosphere,” Ms Huynh said. Packaging alone is not able to control mould and decay – it needs to be tailored to suit the produce – so Ms Huynh is also researching processing methods which may help. 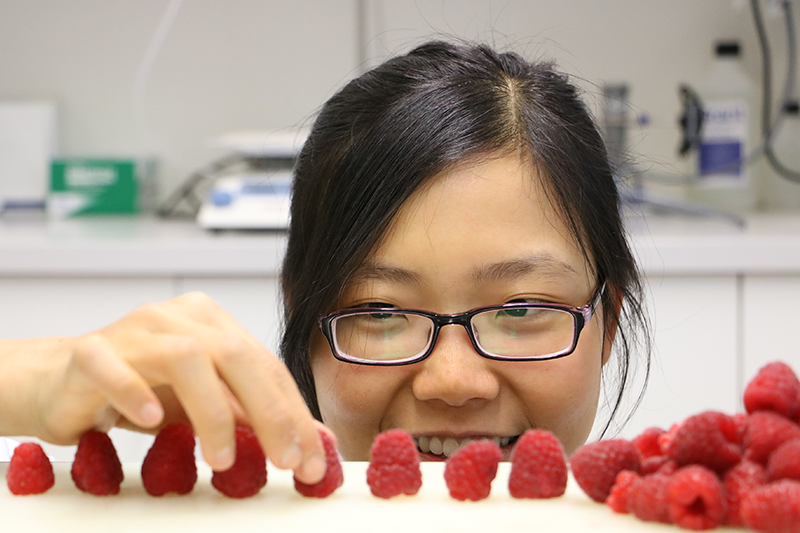 Ms Huynh is conducting her research with Costa Berries, which supplied the raspberries for her trials. Costa Senior Food Safety and Quality Assurance Specialist, Ben Fisher, has been working with Ms Huynh on the project. “There’s a lot of research and thought behind our products, and it’s fantastic to be collaborating with up-and-coming food scientists such as Nha,” Ben Fisher said. “This research will contribute to making sure our storage and packaging is as good as it can be using the latest technology,” he said.